Why should you try to fit in when you were born to stand out? Stacy-Ann moved from Jamaica to St. Maarten at the tender age of 19. With little worldly experience but lots of street smart she learned to be independent at an early age. 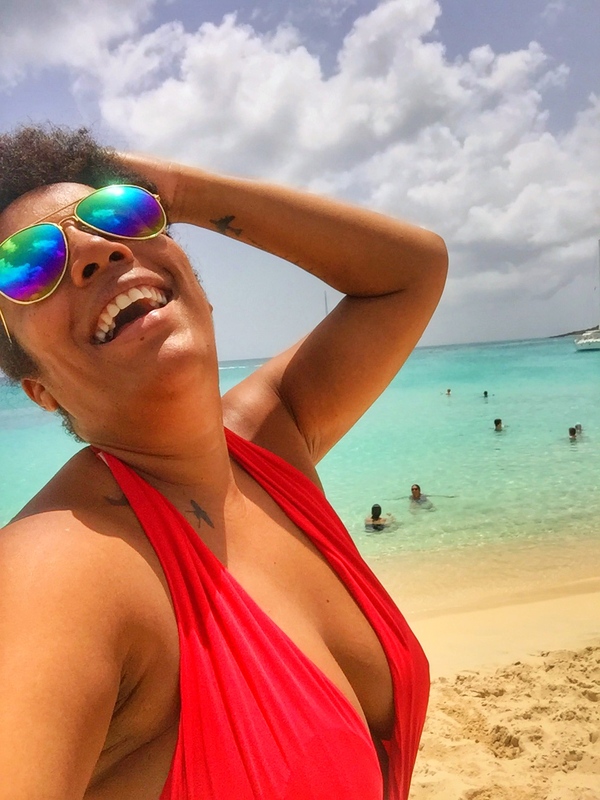 Stacy-Ann made the move to St. Maarten to be closer to her mother who had moved to the island years earlier to be able to better provide for her family back in Kingston. Things for little Stacy-Ann were not easy. In fact growing up in Kingston was tough. Young Stacy-Ann was left in the care of her paternal grandmother. Having lost her father at the age of 6 and her mother being on other islands in search of a better future for her kids it was the obvious choice. She came from a large family and called Kingston 11 her home. In her own words, it was the ghetto and life there was hard. At times she did not know where and if she would get anything to eat. She learned to be a fighter and she graduated from her primary school a valedictorian with eleven A’s and one B. She enrolled herself at an all age Middle Scholar High School and because of her love for sports quickly landed a spot in the school’s Net Ball club. Her Net Ball coach saw her potential and took Stacy-Ann under his wing. She and the other girls would get free lunches and during the week they would have little competitions amongst themselves where whomever performed the best would take home some money. Stacy-Ann was determined and won these competitions every other day. Two days after graduating Stacy-Ann moved to St. Maarten to be with her mother and sister. On St. Maarten she worked different jobs until the one job that changed her life. That job was that of a sales clerk at a local Liz Claiborne store. She was always interested in fashion and beauty. “When going out I used to prepare my outfit from like a week before”, she said giggling. The job at Liz Claiborne fueled her passion for makeup and styling and she grew hungry for more. Her next job at the local MAC store is where she learned makeup artistry. Today she’s an all round artist excelling in personal styling and makeup with an affinity for dancing, acting and singing. She found her home here on the island of St. Maarten. She has traveled to places like Las Vegas, the Netherlands and Los Angeles but the latter she would like to visit again because of the impression it made on her and after all it is the mecca for celebrities and thus where makeup artists and personal stylists can make it big. In the meantime she is working on conquering the Caribbean. When asked what she dislikes most of island life she answered honestly: “We basically do not appreciate the color of our skin or that of our sisters. We do not appreciate each other as individuals. It doesn’t only have to do with the skin color but with the person that we are. There is not a lot of self love”. Stacy-Ann describes herself as bubbly, friendly and very customer oriented. She is working towards getting herself certified as a professional makeup artist and opening a makeup school to help others get certified. Currently Stacy-Ann can be found giving makeup classes to women on how to apply their own makeup. “Recently I have been thinking a lot about my mother with whom I don’t have the best of relationships. She inspires me in a way. She has been struggling for so many years but it’s almost like she doesn’t want to get out of that struggle. So she inspires me NOT to get to where she was or is. She inspires me to do much better”. Her current status is Happily married to her Dutch husband Marc with two lovely children. I asked her if it was a challenge being married to someone with a complete different background than her own. She answered in typical Stacy-Ann fashion: “We are basically the same even if our backgrounds are different. So we mesh very well together and our difference in background is not an issue”. She names the day she decided to work for herself as the highlight of her life thus far. Even if the births of her children and marrying her husband are very important to her. “That was definitely one of the best moments in my life. Because of the potential that I have, it is better if I invest in my own business, my own empire rather than building somebody else’s”. During all this Stacy-Ann remains true to her Jamaican roots. I asked her what three things she misses most from back home and being the true Caribbean girl that she is she named firstly of course the food (Rice and peas with Akee and salt fish) followed by her father’s side of her family and playing sports. The level of net ball here is just not the same, according to Stacy-Ann. I just love the Jamaican accent and it wouldn’t be me if I didn’t ask her for one of her favorite Jamaican sayings. And she gave this: “If yuh really wah good yuh nose af e run”, which means simply that you need to work hard to achieve success. You can catch Stacy-Ann Taylor on her Facebook page: Taste of Fashion or her You Tube channel Stacy-Ann Taylor. Email her at stacyanntaylor1890@gmail.com or call her at +1 (721) 522 6866 for an appointment. Stacy -Ann I’m very proud of you . Your” Mom” Sinfra and Anenda’s mom.